I was going for this but since I needed 3 seats, and because I’m going for high quality/lower budget solutions, I decided on a much more affordable option. 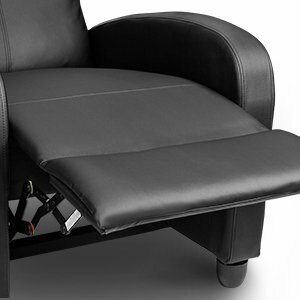 The Hormall Single Recliner Seat is one of the lower priced chairs. I’d allowed a bit more in the budget but this one had the cleaner lines I was looking for, not to mention the better reviews. So I went for it. I can’t even remember what my dream chair looked like anymore. That’s not entirely true. They were leather and they glowed neon blue. These chairs aren’t leather but they wipe off easily and they don’t feel cheap. Maximum home theater experience, with a less than Maximum budget.